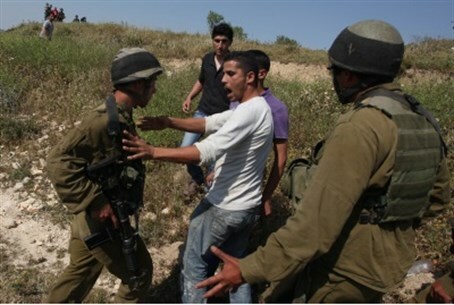 Report: number of soldiers injured by rocks is soaring but they are not allowed to open fire. A report by a political activist and reservist combat soldier claims the IDF has effectively capitulated in the face of Arab rock and firebomb attacks. Writing in the web magazine Mida, Erez Tadmor says that in the past week, since the grave injury of Yaakov Zlatkin at the hands of an Arab mob, he has spoken with dozens of officers and soldiers who all said the same thing: The health and security of Jews who live in Judea and Samaria, as well as those of the soldiers who are supposed to guard them, have been left to the mercy of the enemy. The data show a sharp rise in the number of rock and fire bomb attacks, possibly in the hundreds of percentage points, writes Tadmor, and a growing number of soldiers have suffered injuries to the limbs and face in the past few weeks. "But most serious of all is the fact that IDF soldiers are operating without motivation to strive for contact with the enemy and refrain from any proper response to the threats to their lives and those of the civilians. "Central Command and the Judea and Samaria theater have turned into a Russian roulette in the last few months, in which the lives, health and dignity of soldier and civilians hang in the balance, while Palestinian marauders enjoy near complete immunity in what an only be described as operational recklessness." Tadmor explained that Zlatkin was gravely injured by Arabs in the course of a protest by residents of Talmon and Neria, despite the presence of four armed soldiers. The soldiers' presence does not guarantee the safety of civilians, he said, "especially when they are afraid to exit their rock-proofed vehicle, for fear that they will have to open fire and will face the real threat: the possibility of being put on trial." Two days before that attack, he writes, dozens of marauding Arabs attacked vehicles in the same area, at the Bitilu junction. The first vehicle attacked by a mob hurling rocks and metal bars was a military one with five soldiers inside, but they escaped without responding and did not even warn other vehicles of the ambush they were about to enter. Tadmor quotes a soldier who says that he and other soldiers were ordered not to pursue an Arab who had just thrown a fire bomb at their position near Kiryat Netafim. "For 15 minutes he stood there and cursed us and we could not give chase," the soldier said. "The orders in this case are clear: throwing a fire bomb at a pillbox is not considered a life-threatening action," the soldier said. "Inside the pillbox compound there is a genderator, and next to it there is a gasoline container, and above this there is a net for shade hanging on the side, it is all completely flammable. Now, can someone honestly say that a firebomb on the gasoline container is not life threatening?" The accompanying video shows an Arab riot as videotaped from inside an IDF position. The red flash at the end is a fire bomb exploding.